A new book tells the story of the Pullman Strike, an epic late 19th century clash between labor and capital that shook the nation and led Eugene Debs to Socialism. 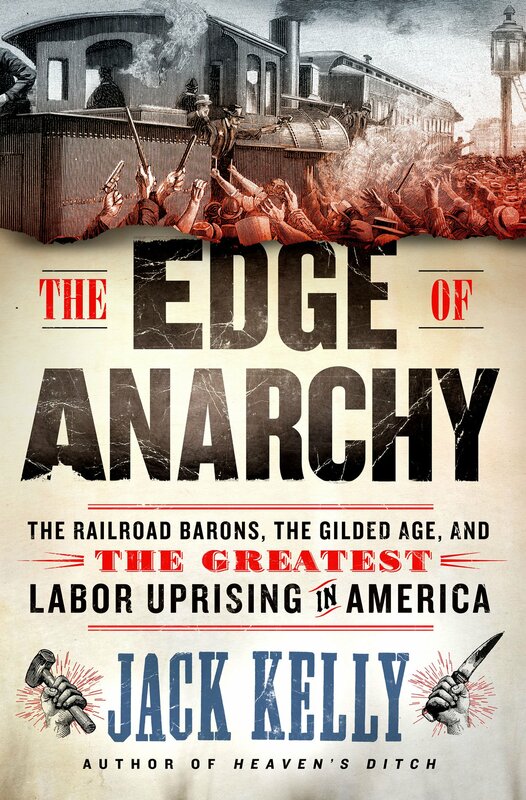 So I was very interested when Jack Kelly’s “The Edge of Anarchy: The Railroad Barons, the Gilded Age, and the Greatest Labor Uprising in America” appeared, since this deals in great detail with Debs’s famous 1894 Pullman strike, certainly a pivotal moment in U.S. labor history. The book is framed as a clash between two giants of the day, with Debs representing labor and George Pullman representing capital, in a major Gilded Age strike on the railroads, the key industry of the late 19th century. Kelly does a great job of telling a lively and readable story of the strike, with lots of detail that helps us understand the challenges of labor organizing in the 1890s. He is sympathetic to labor, but doesn’t caricature Pullman or his capitalist allies as merely greedy or evil. They were representatives of an upper class at the time who held extremely conservative views on “free enterprise,” property rights and the natural subordinate place of workers in the capitalist system. This strike also centers the conflict between competing versions of unionism and shows the radicalization of Debs who would go on to become the most famous American socialist in history. And though this strike was lost, the conflict followed a familiar pattern in history – that while workers are dealt with harshly by employers and the government, their organizing leads to reforms that slowly address some of their terrible working conditions. It was the dramatic growth of the railroads that helped bring about this transformation, stimulating an explosion of steel, coal, machine tool production and other industries. Moreover, this raw, under-regulated, robber-baron capitalism, generated staggering inequality, with three-quarters of the national wealth held by only 200,000 people — less than one percent of the population. In these circumstances, the book nicely presents the back-stories of Debs and Pullman which set the stage for the conflict. Debs grew up in Indiana and went to work on the railroad at age 14, becoming a fireman several years later – shoveling coal, monitoring the engine and watching the tracks. He soon joined the Brotherhood of Locomotive Firemen, becoming the editor of the union’s magazine. What was surprising to me is the reminder that the young Debs held fairly conservative union views. He had absorbed the ideology of the railroad craft unions at the time which saw their organizations as providers of skilled labor for a decent wage. But Debs was radicalized over time, as the railroads consolidated into “management bureaucracies” that degraded working conditions. He tried unsuccessfully to build a stronger alliance among the rail brotherhoods that often betrayed each other. It’s interesting to see his evolution toward the left, toward a new model of union — organized on an industrial basis, where any worker on the railroad could join, even those considered “unskilled” by the craft unions. In 1893, Debs organized the founding meeting of the American Railway Union (ARU), open to all 750,000 railroad workers. Even with this new kind of union, Debs was wary of strikes. He believed that if the union was strong enough, management would settle grievances without the need for striking. George Pullman grew up in New York, and worked at the family construction business. After making money in the Colorado gold rush, he settled in Chicago and took over a sleeping car business. His company upgraded the sleeper quality and redesigned the car for more comfort. The growth of the railroads, including five transcontinental lines, meant more long trips and demand for sleeper cars. Pullman slowly developed a near monopoly. Leasing the cars and maintaining control over them, he built one of largest vertically integrated factories in the world. His new company town of Pullman, south of Chicago, was a meticulously planned city to “improve” the workers who lived there. Like many of his class, he wanted to help on his terms and within his understanding. Some aspects of the town were positive, for example the quality housing and schools. But the book makes clear, the workers were living in a dictatorship, with no local government and Pullman executives controlling the town. Moreover, houses were owned by Pullman and rented to make money. Personally, Pullman was known for being cold, reserved and dictatorial, a great contrast to the friendly, gregarious and humble Debs. A major depression started in 1893, with rising unemployment, and there was discontent developing at Pullman. In one of the most infamous labor-management decisions in U.S. history, Pullman cut wages drastically, but not rents. Workers were plunged into poverty and brought their complaints to management. In hindsight, Pullman blundered by making no improvements which may have prevented the strike. Workers joined the ARU and thousands walked out. The union asked for negotiations but the company replied that there was “nothing to arbitrate,” which became its famous phrase. Soon afterwards, the ARU held its convention in Chicago. This is one of those historic labor meetings I would have loved to attend and Kelly does a nice job of describing the debates in this key decision point of the strike. Pullman workers pleaded for help, arguing that wage cuts at Pullman would cause competitors to reduce wages, leading to more rounds of the “dance of skeletons bathed in human tears.” Debs was cautious and wasn’t sure the ARU was ready for this confrontation. He proposed another arbitration offer and more committee discussions. But the convention voted to support the workers with a Pullman car boycott. All ARU members were instructed to not handle Pullman cars in any way – no inspections, no attaching them to trains, and no running of trains that included them. ARU members started their boycott and if any were fired, other members walked off the job in support. Within days the strike became a larger industry-wide labor dispute. Years earlier, the railroad corporations had formed the General Managers’ Association (GMA) to coordinate union-busting activities and fix wages and prices. The GMA got involved in fighting the ARU strike, seeing it as an existential threat to the industry. The strike spread throughout the country, idling hundreds of thousands of workers. Passenger transportation was disrupted, and food and coal shipments were delayed, with prices rising. The New York Times declared that ”the strike had ‘assumed the proportions of the greatest battle between labor and capital that has ever been inaugurated in the United States.’” Pullman’s wife Hattie wrote in her diary “strike situation very serious.” Public sympathy was with the strikers and against the “leviathan, with tentacles of steel” as an author of the time described the railroads. But the government moved quickly to crush the strike. U.S. Attorney General Richard Olney spent his career as a lawyer in the railroad industry and sided with the employers. He recruited thousands of “marshalls,” paid by the railroads, as a private strike-breaking force. He also issued a strike injunction based on the Anti-Trust act and restraint of interstate commerce which was of course never applied to the GMA. The injunction’s broad scope banned the union from communicating with members about the strike and even barred members from talking to scabs to convince them not to work. State militia and over 16,000 federal troops were mobilized to get the trains running. Police fired on people, injuring and killing dozens. Over the next week, they managed to get more of the rail system running again. Publicly mediated arbitration efforts came and went but the companies refused to negotiate again and again. Chicago unions conducted a general strike, but participation was low and it was considered unsuccessful. Debs saw an expansion of the strike as the only way forward and he appealed for help to American Federation of Labor (AFL) President Samuel Gompers. This is a second key decision point of the strike, whether or not the labor movement as a whole would provide solidarity. But Gompers was considered a realist. Gompers was not supportive of the industrial union framework, since he believed that workers’ power and leverage resided only in their skills. In this, we have a real conflict between two visions of unionism. Debs believed anything was possible if more workers would join the struggle. Gompers didn’t have faith in most unskilled workers and the AFL rejected a wider general strike. President Cleveland announced that he would appoint a commission to investigate the strike after it was over. Debs treated this as a government plan to arbitrate and he offered the industry a return to work. The GMA refused, and the strike sputtered out as workers tried to get their jobs back. The ARU voted to officially call off the boycott several weeks later. Some workers were rehired but had to sign “yellow dog” contracts promising they wouldn’t join a union. Railroad companies used a blacklist to keep out strikers and about ¾ of the workers never got their jobs back. While the story of a crushed strike is all too common in U.S. history, the Commission appointed to investigate the strike was not, and it held two weeks of hearings. Debs and Gompers called for better regulation of the railroad companies. But Debs goes further, proposing government ownership of the railroads, rather than “railroad ownership of Government.” He also proposed something more radical, and it’s fascinating to see him taking another step to the left, stating “I believe in a cooperative commonwealth as a substitute for the wage system,” where workers would get the wealth they produced. The Commission’s 700 page report harshly criticized Pullman and the GMA. It went easy on the union, and called for pro-labor reforms. This led to the passage of progressive federal labor and health and safety legislation several years later. Debs and union officials were convicted of violating the injunction and Debs was sentenced to six months in jail. An appeal went to the Supreme Court, which affirmed the decision. A criminal conspiracy case against Debs was dismissed as there was evidence that the GMA had disrupted trains to make the ARU look bad. President Cleveland’s Democratic Party lost big in the 1894 and 1896 elections, as his heavy-handed response to the strike alienated workers. Debs finished his jail sentence, reading up on socialism while incarcerated. Upon his arrival back in Chicago he was greeted by 100,000 people. Debs soured on the mainstream political parties and declared himself a socialist in 1897, “’The stark issue,’ he proclaimed, was, ’Socialism vs. Capitalism. I am for Socialism because I am for humanity.’” He famously ran for president five times under his newly formed Socialist Party between 1900 and 1920, getting 6% of the vote in 1912 and almost a million votes in 1920 while in prison for speaking out against World War One. He helped found the Industrial Workers of the World (IWW) in 1905, another militant, industrial union which still exists. President Harding commuted his sentence, and Debs died of a heart attack in 1926 at 71 years old. The ARU leadership didn’t really want this strike, only supporting the workers because they needed help. However, waging a huge strike against the railroad industry amidst government repression was too much for the union. Wider labor solidarity would have helped, but that was difficult to get during a depression when workers were desperate for jobs. Even though the strike was lost, the issues raised helped usher in Progressive Era reforms, which were the precursor to the New Deal era. And Debs’s view of the necessity of industrial unions was adopted by the IWW and later became mainstream with the formation of the CIO in the 1930s and the organization of the auto, steel and other large industries. Of course the battle between labor and capital has never ended. But for a brief time after World War Two, unions perhaps had the power than Debs always wanted, with enough strength to bargain for increasingly better wages, benefits and working conditions. But since the 1970s unions have been in decline, and amazingly, private sector union density is now 6.4%, about the same as back in 1900 in Debs’s day. Debs would no doubt be encouraged by the recent rise of the Democratic Socialists of America (with its roots in his Socialist Party) and millions of people in the U.S. once more interested in socialist ideas. We can again take up the issues he raised so forcefully through his union struggles and presidential campaigns in our fight for the transformation of society. Eric Dirnbach is a labor movement researcher and a member of NYC DSA.